Wolfgang Ketterle is John D. MacArthur Professor of Physics at the Massachusetts Institute of Technology (1990-present). Other institutional affiliations include the University of Heidelberg and the Max Planck Institute for Quantum Optics. His research interests include laser spectroscopy and Bose-Einstein condensation. October 21, 1957Birth, Heidelberg (Germany). 1978Obtained Vordiplom, University of Heidelberg (Universtät Heidelberg), Heidelberg (Germany). 1982Obtained Diplom, Technical University of Munich (Technische Universität München), Munich (Germany). 1982 – 1988Research Assistant (1982-1985) and Staff Scientist (1985-1988), Max Planck Institute for Quantum Optics (Max-Planck-Institut für Quantenoptik), Munich (Germany). 1986Obtained PhD in Physics, Ludwig-Maximilians University of Munich (Universität München), Munich (Germany). 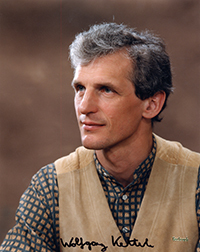 1989 – 1990Research Scientist, Department of Physical Chemistry, University of Heidelberg (Universtät Heidelberg). 1990Fellow, American Academy of Arts and Sciences. 1990 – presentResearch Associate (1990-1993); Assistant Professor of Physics (1993-1997); Professor of Physics (1997-1998); and John D. MacArthur Professor of Physics (1998-present), Massachusetts Institute of Technology (MIT), Cambridge (Mass.). 1997Awarded I. I. Rabi Prize in Atomic, Molecular and Optical Physics, American Physical Society. 2001Awarded Nobel Prize in Physics with Eric A. Cornell and Carl E. Wieman "for the achievement of Bose-Einstein condensation in dilute gases of alkali atoms, and for early fundamental studies of the properties of the condensates". 2007 – presentDirector, MIT-Harvard Center for Ultracold Atoms, Cambridge (Mass.). Shared the 2001 Nobel Prize in Physics along with Carl Wieman "for the achievement of Bose-Einstein condensation in dilute gases of alkali atoms, and for early fundamental studies of the properties of the condensates." Post-doc advisor at Massachusetts Institute of Technology (MIT). Advised by Ketterle at Massachusetts Institute of Technology (MIT). PhD advisor at Max Planck Institute. Advised by Ketterle at Massachusetts Institute of Technology (MIT), "High-temperature superfluidity in an ultracold Fermi gas." Research Associate; Assistant Professor of Physics; Professor of Physics; John D. MacArthur Professor of Physics; and Director, MIT-Harvard Center for Ultracold Atoms. Research Assistant and Staff Scientist. Obtained Vordiplom and Research Scientist, Department of Physical Chemistry. Fellow and Awarded I. I. Rabi Prize in Atomic, Molecular and Optical Physics. Obtained PhD (Physics) in 1986.